From top to bottom, SATA Certification Logo, SATA cable, and two first-generation (1.5 Gbit/s) SATA data connectors on a motherboard. Serial ATA(SATA or Serial Advanced Technology Attachment) is a computer businterface for connecting host bus adaptersto mass storage devicessuch as hard disk drivesand optical drives. Serial ATA was designed to replace the older ATA (AT Attachment)standard (also known as EIDE), offering several advantages over the older parallel ATA(PATA) interface: reduced cable-bulk and cost (7 conductors versus 40), native hot swapping, faster data transferthrough higher signalling rates, and more efficient transfer through an (optional) I/O queuing protocol. SATA host-adapters and devices communicate via a high-speed serialcable over two pairs of conductors. In contrast, parallel ATA (the redesignationfor the legacy ATA specifications) used a 16-bit wide data bus with many additional support and control signals, all operating at much lower frequency. To ensure backward compatibility with legacy ATA software and applications, SATA uses the same basic ATA and ATAPI command-set as legacy ATA devices. As of 2009[update], SATA has replaced parallel ATA in most shipping consumer desktop and laptop computers, and is expected to eventually replace PATA in embedded applications where space and cost are important factors. SATA's market share in the desktop PC market was 99% in 2008.PATA remains widely used in industrial and embedded applications that use CompactFlashstorage, though even here, the next CFaststorage standard will be based on SATA. Serial ATA industry compatibility specifications originate from The Serial ATA International Organization (aka. SATA-IO, serialata.org). The SATA-IO group collaboratively creates, reviews, ratifies, and publishes the interoperability specifications, the test cases, and plug-fests. As with many other industry compatibility standards, the SATA content ownership is transferred to other industry bodies: primarily the INCITST13subcommitteeATA, the INCITS T10subcommittee (SCSI); a subgroup of T10 responsible for Serial Attached SCSI(SAS). The complete specification from SATA-IO.The remainder of this article will try to use the terminology and specifications of SATA-IO. Advanced Host Controller Interface (AHCI)is an open host controller interface published and used by Intel, which has become a de facto standard. It allows the use of advanced features of SATA such as hotplugand native command queuing(NCQ). If AHCI is not enabled by the motherboard and chipset, SATA controllers typically operate in "IDE emulation" mode, which does not allow features of devices to be accessed if the ATA/IDE standard does not support them. Windows device drivers that are labeled as SATA are often running in IDE emulation mode unless they explicitly state that they are AHCI mode, in RAIDmode, or a mode provided by a proprietary driver and command set that was designed to allow access to SATA's advanced features before AHCI became popular. Modern versions of Microsoft Windows, FreeBSD, Linuxwith version 2.6.19 onward,as well as Solarisand OpenSolarisinclude support for AHCI, but older OSs such as Windows XPdo not. Even in those instances, a proprietary driver may have been created for a specific chipset, such as Intel's. First-generation SATA interfaces, now known as SATA 1.5 Gbit/s, communicate at a rate of 1.5 Gbit/s. Taking 8b/10b encodingoverhead into account, they have an actual uncoded transfer rate of 1.2 Gbit/s (150 MB/s). The theoretical burst throughput of SATA 1.5 Gbit/s is similar to that of PATA/133, but newer SATA devices offer enhancements such as NCQ, which improve performance in a multitasking environment. During the initial period after SATA 1.5 Gbit/s finalization, adapter and drive manufacturers used a "bridge chip" to convert existing PATA designs for use with the SATA interface.Bridged drives have a SATA connector, may include either or both kinds of power connectors, and, in general, perform identically to their PATA equivalents. Most lack support for some SATA-specific features such as NCQ. Native SATA products quickly eclipsed bridged products with the introduction of the second generation of SATA drives. As of April 2010 mechanical hard disk drivescan transfer data at up to 157 MB/s,which is beyond the capabilities of the older PATA/133 specification and also exceeds a SATA 1.5 Gbit/s link. Second generation SATA interfaces running at 3.0 Gbit/s are shipping in high volume as of 2010[update], and prevalent in allSATA disk drives and the majority of PC and server chipsets. With a native transfer rate of 3.0 Gbit/s, and taking 8b/10b encodinginto account, the maximum uncoded transfer rate is 2.4 Gbit/s (300 MB/s). The theoretical burst throughput of SATA 3.0 Gbit/s is roughly double that of SATA revision 1. All SATA data cables meeting the SATA spec are rated for 3.0 Gbit/s and will handle current mechanical drives without any loss of sustained and burst data transfer performance. However, high-performance flash drives are approaching SATA 3 Gbit/s transfer rate, and this is being addressed with the SATA 6 Gbit/s interoperability standard. Serial ATA International Organizationpresented the draft specification of SATA 6 Gbit/s physical layer in July 2008,and ratified its physical layer specification on August 18, 2008.The full 3.0 standard was released on May 27, 2009.It provides peak throughput of about 600 MB/s (Megabytes per second) including the protocol overhead (10b/8b coding with 8 bits to one byte). Solid-state drives have already saturated SATA 3 Gbit/s with 285/275 MB/s max read/write speed and 250 MB/s sustained with the Sandforce 1200 and 1500 controller. SandForceSSD controllers released in 2011 have delivered 500 MB/s read/write rates,and ten channels of fast flash can reach well over 500 MB/s with new ONFIdrives – a move from SATA 3 Gbit/s to SATA 6 Gbit/s allows such devices to work at their full speed. Full performance from Crucial's C300 SSD similarly require SATA 3.0. As for standard hard disks, the reads from their built-in DRAM cachewill end up faster across the new interface.SATA 6 Gbit/s hard drives and motherboards are now shipping from several suppliers. Intel's current Sandy Bridge platform offers 6 Gbit/s SATA ports as standard. Isochronous Native Command Queuing(NCQ) streaming command to enable isochronousquality of service data transfers for streaming digital content applications. A small low insertion force(LIF) connector for more compact 1.8-inch storage devices. Alignment with the INCITSATA8-ACS standard. In general, the enhancements are aimed at improving quality of service for video streamingand high-priority interrupts. In addition, the standard continues to support distances up to a meter. The new speeds may require higher power consumption for supporting chips, factors that new process technologies and power management techniques are expected to mitigate. The new specification can use existing SATA cables and connectors, although some OEMsare expected to upgrade host connectors for the higher speeds.Also, the new standard is backwards compatible with SATA 3 Gbit/s. The name SATA II has become synonymous with the 3 Gbit/s standard. In order to provide the industry with consistent terminology, the SATA-IO has compiled a set of marketing guidelines for the third revision of the specification. The SATA 6 Gbit/s specification should be called Serial ATA International Organization: Serial ATA Revision 3.0. The technology itself is to be referred to as SATA 6 Gb/s. A product using this standard should be called the SATA 6 Gb/s [product name]. Using the terms SATA III or SATA 3.0 to refer to a SATA 6 Gbit/s product is unclear and not preferred. SATA-IO has provided a guideline to foster consistent marketing terminology across the industry. A 7-pin SATA data cable. SATA connector on a hard drive; data connections on the left and power connections on the right. The SATA standard defines a data cable with seven conductors (3 grounds and 4 active data lines in two pairs) and 8 mm wide wafer connectors on each end. SATA cables can have lengths up to 1 metre (3.3 ft), and connect one motherboard socket to one hard drive. PATA ribbon cables, in comparison, connect one motherboard socket to one or two hard drives, carry either 40 or 80 wires, and are limited to 45 centimetres (18 in) in length by the PATA specification (however, cables up to 90 centimetres (35 in) are readily available). Thus, SATA connectors and cables are easier to fit in closed spaces, and reduce obstructions to air cooling. They are more susceptible to accidental unplugging and breakage than PATA, but cables can be purchased that have a locking feature, whereby a small (usually metal) spring holds the plug in the socket. One of the problems associated with the transmission of data at high speed over electrical connections is described as noise, which is due to electrical coupling between data circuits and other circuits. As a result, the data circuits can both affect other circuits, and be affected by them. Designers use a number of techniques to reduce the undesirable effects of such unintentional coupling. One such technique used in SATA links is differential signaling. This is an enhancement over PATA, which uses single-ended signaling. Some PATA cables use 80 wires, where only 40 wires carry signals. A 15-pin SATA power connector. Note that this connector is missing the 3.3V (orange) wire. A third voltageis supplied, 3.3 V, in addition to the traditional 5 V and 12 V.
Five pins grouped together provide ground. For each of the three voltages, one of the three pins serves for hotplugging. The ground pins and power pins 3, 7, and 13 are longer on the plug (located on the SATA device) so they will connect first. A special hot-plug receptacle (on the cable or a backplane) can connect ground pins 4 and 12 first. Pin 11 can function for staggered spinup, activity indication, or nothing. Staggered spinup is used to prevent many drives from spinning up simultaneously, as this may draw too much power. Activity is an indication of whether the drive is busy, and is intended to give feedback to the user through an LED. Adapters are available that convert a 4-pin Molex connectorto a SATA power connector. 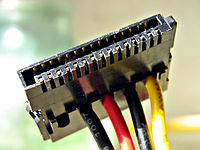 Generally, because the power lines on 4-pin Molex connectors do not provide 3.3 V power, these adapters provide only 5 V and 12 V power on the SATA end and leave the 3.3 V lines unconnected. This precludes the use of such adapters with drives that require 3.3 V power. Because of this, drive manufacturers have largely not used the 3.3 V power lines. There also exist some 4-pin Molex to SATA power adapters which include electronics to provide 3.3 V power. A 6-pin Slimline SATA power connector. The back of a SATA-based slimline optical drive. SATA 2.6 first defined the slimline connector, intended for smaller form-factors; e.g., notebook optical drives. Note that pin 1 (device presence) is shorter than the others. A 1.8-inch (46-millimeter) hard drive, showing data connector and micro power connector. The micro connector originated with SATA 2.6. It is intended for 1.8-inch (46 mm) hard drives. There is also a micro data connector, which is similar to the standard data connector, but is slightly thinner. Minimum transmit potential increased: Range is 500–600 mV instead of 400–600 mV. Minimum receive potential decreased: Range is 240–600 mV instead of 325–600 mV. The external connector has no "L"-shaped key, and the guide features are vertically offset and reduced in size. This prevents the use of unshielded internal cables in external applications and vice-versa. To prevent ESDdamage, the design increased insertion depth from 5 mm to 6.6 mm and the contacts are mounted farther back in both the receptacle and plug. To provide EMIprotection and meet FCC and CE emission requirements, the cable has an extra layer of shielding, and the connectors have metal contact-points. The connector shield has retention springs in on both the top and bottom surfaces. The external connector and cable have a design-life of over five thousand insertions and removals, whereas the internal connector is specified to withstand only fifty. Aimed at the consumer market, eSATA enters an external storage market served also by the USB and FireWire interfaces. Most external hard-disk-drive cases with FireWire or USB interfaces use either PATA or SATA drives and "bridges" to translate between the drives' interfaces and the enclosures' external ports; this bridging incurs some inefficiency. Some single disks can transfer 157 MB/s during real use,about four times the maximum transfer rate of USB 2.0 or FireWire 400 (IEEE 1394a)and almost twice as fast as the maximum transfer rate of FireWire 800. The S3200 FireWire1394b spec reaches ~400 MB/s (3.2 Gbit/s), and USB 3.0has a nominal speed of 5 Gbit/s. Some low-level drive features, such as S.M.A.R.T., may not operate through some USB or FireWire or USB+FireWire bridges; eSATA does not suffer from these issues provided that the controller manufacturer (and its drivers) presents eSATA drives as ATA devices, rather than as "SCSI" devices, as has been common with Silicon Image, JMicron, and NVIDIAnForce drivers for Windows Vista. In those cases SATA drives will not have low-level features accessible. Firewire's future 6.4 Gbit/s (768 MB/s) will be faster than eSATA I. The eSATA version of SATA 6G will operate at 6.0 Gbit/s (the term SATA III is being eschewed by the SATA-IO to avoid confusion with SATA II 3.0 Gbit/s, which was colloquially referred to as "SATA 3G" [bps] or "SATA 300" [MB/s] since 1.5 Gbit/s SATA I and 1.5 Gbit/s SATA II were referred to as both "SATA 1.5G" [b/s] or "SATA 150" [MB/s]). Therefore, they will operate with negligible differences between them.Once an interface can transfer data as fast as a drive can handle them, increasing the interface speed does not improve data transfer. Most computers have USB ports, and many computers and consumer electronic appliances have FireWire ports, but few devices have external SATA connectors. For small form-factor devices (such as external 2.5-inch (64 mm) disks), a PC-hosted USB or FireWire link can usually supply sufficient power to operate the device. However, eSATA connectors cannot supply power, and require a power supply for the external device. The related eSATAp(but mechanically incompatible) connector adds power to an external SATA connection, so that an additional power supply is not needed.Some e-sata ports double as eSATA/USB. Desktop computers without a built-in eSATA interface can install an eSATA host bus adapter(HBA); if the motherboard supports SATA, an externally available eSATA connector can be added. Notebook computers can be upgraded with Cardbusor ExpressCardversions of an eSATA HBA. With passive adapters, the maximum cable length is reduced to 1 metre (3.3 ft) due to the absence of compliant eSATA signal-levels. eSATAp stands for powered eSATA. It is also known as Power over eSATA, eSATA USB Hybrid Port (EUHP), or eSATA/USB Combo. An eSATAp port combines the 4 pins of the USB 2.0 (or earlier) port, the 7 pins of the eSATA port, and optionally two 12-volt power pins.Both SATA traffic and device power are integrated in a single cable, as is the case with USB but not eSATA. Power at 5 volts is provided through two USB pins; power at 12 Volts may optionally be provided. Typically desktop, but not notebook, computers provide 12 volt power, so can power devices requiring this voltage, typically 3.5" disk and CD/DVD drives, in addition to 5 volt devices such as 2.5" drives. Both USB and eSATA devices can be used with an eSATAp port, when plugged in with a USB or eSATA cable, respectively. An eSATA device cannot be powered via an eSATA cable, but cables are available which make available both SATA or eSATA and power connectors from an eSATAp port. An eSATAp connector can be built into a computer with internal SATA and USB, by fitting a bracket with connections for internal SATA, USB, and power connectors and an externally accessible eSATAp port. Although eSATAp connectors have been built into several devices, manufacturers do not refer to an official standard. Prior to the final eSATA 3 Gbit/s specification, a number of products were designed for external connection of SATA drives. Some of these use the internal SATA connector, or even connectors designed for other interface specifications, such as FireWire. These products are not eSATA compliant. The final eSATA specification features a specific connector designed for rough handling, similar to the regular SATA connector, but with reinforcements in both the male and female sides, inspired by the USB connector. eSATA resists inadvertent unplugging, and can withstand yanking or wiggling, which could break a male SATA connector (the hard-drive or host adapter, usually fitted inside the computer). With an eSATA connector, considerably more force is needed to damage the connector, and if it does break it is likely to be the female side, on the cable itself, which is relatively easy to replace. Prior to the final eSATA 6 Gbit/s specification many add-on cards and some motherboards advertised eSATA 6 Gbit/s support because they had 6 Gbit/s SATA 3.0 controllers for internal-only solutions. Those implementations are non-standard, and eSATA 6 Gbit/s requirements will be ratified in the upcoming SATA 3.1 specification.These products might not be eSATA 6 Gbit/s compliant. Mini-SATA not to be confused with the micro connector was announced by the Serial ATA International Organization, September 21, 2009.Applications include netbooksand other devices that require a smaller solid-state drive. The connector resembles a miniPCIe(mini PCI Express) card interface. SATA physical coding uses a line encoding system known as 8b/10b encoding. This scheme serves multiple functions required to sustain a differential serial link. First, the stream contains necessary synchronization information that allows for SATA host/drive to extract clocking. The 8b/10b encoded sequence embeds periodic edge transitions to allow the receiver to achieve bit-alignment without the use of a separately transmitted reference clock waveform. The sequence also maintains a neutral (DC-balanced) bitstream, which allows the transmit drivers and receiver inputs to be AC-coupled. Separate point-to-point AC-coupled LVDSlinks are used for physical transmission between host and drive. SATA topology: host (H), expansor (M), and device (D). SATA uses a point-to-point architecture. The physical connection between a controller and a storage device is not shared among other controllers and storage devices. SATA defines multipliers, which allows a single SATA controller to drive multiple storage devices. The multiplier performs the function of a hub; the controller and each storage device is connected to the hub. The common heritage of the ATA command set has enabled the proliferation of low-cost PATA to SATA bridge-chips. Bridge-chips were widely used on PATA drives (before the completion of native SATA drives) as well as standalone "dongles. "When attached to a PATA drive, a device-side dongle allows the PATA drive to function as a SATA drive. Host-side dongles allow a motherboard PATA port to function as a SATA host port. The market has produced powered enclosures for both PATA and SATA drives that interface to the PC through USB, Firewire or eSATA, with the restrictions noted above. PCIcards with a SATA connector exist that allow SATA drives to connect to legacy systems without SATA connectors. The designers of SATA aimed for backward and forward compatibilitywith future revisions of the SATA standard. According to the hard drive manufacturer Maxtor, motherboard host controllers using the VIA and SIS chipsets VT8237, VT8237R, VT6420, VT6421L, SIS760, SIS964 found on the ECS 755-A2 manufactured in 2003, do not support SATA 3 Gbit/s drives. Additionally, these host controllers do not support optical disc drives that support only the SATA 3 Gbit/s standard. Users with a SATA 1.5 Gbit/s motherboard with one of the listed chipsets should either buy an ordinary SATA 1.5 Gbit/s hard disk, buy a SATA 3 Gbit/s hard disk switchable to 1.5 Gbit/s, or buy a PCI or PCI-E card to add full SATA 3 Gbit/s capability and compatibility. To prevent interoperability problems that could occur when next generation SATA drives are installed on motherboards with legacy standard SATA 1.5 Gbit/s motherboard host controllers, many manufacturers have made it easy to switch those newer drives to the previous standard's mode. For example, Seagate/Maxtor has added a user-accessible jumper-switch, known as the Force 150, to enable the drive to be switched between 1.5 Gbit/s and 3 Gbit/s operation. Western Digital uses a jumper setting called OPT1 Enabled to force 1.5 Gbit/s data transfer speed (OPT1 is enabled by putting the jumper on pins 5 & 6). Samsung drives can be switched to 1.5 Gbit/s mode using software that may be downloaded from the manufacturer's website. Upgrading a Samsung drive in this manner requires the temporary use of a SATA-2 (SATA 3.0 Gbit/s) controller while programming the drive. The Force 150 switch is also useful when attaching SATA 300 hard drives on SATA controllers on PCI cards, since many of these controllers (such as the Silicon Images chips) will run at SATA300 even though the PCI bus cannot even reach SATA150 speeds. This can cause data corruption in operating systems that do not specifically test for this condition and limit the disk transfer speed. SCSIuses a more complex bus than SATA, usually resulting in higher manufacturing-costs. SCSI buses also allow connection of several drives on one shared channel, whereas SATA allows one drive per channel, unless using a port multiplier. SATA 3 Gbit/s theoretically offers a maximum bandwidth of 300 MB/s per device which is only slightly worse than the rated speed for SCSI with a maximum of 320 MB/s in total for all devices on a bus.SCSI drives provide greater sustained throughput than multiple SATA drives connected via a simple (i. e. command-based) port multiplierbecause of disconnect-reconnect and aggregating performance.In general, SATA devices link compatibly to SAS enclosures and adapters, whereas SCSI devices cannot be directly connected to a SATA bus. SCSI, SAS, and fibre-channel (FC) drives are more expensive than SATA, so they are used in serversand disk arrayswhere the better performance justifies the additional cost. Inexpensive ATA and SATA drives evolved in the home-computermarket, hence there is a view that they are less reliable. As those two worlds overlapped, the subject of reliability became somewhat controversial. Note that, in general, the failure rate of a disk drive is related to the quality of its heads, platters and supporting manufacturing processes, not to its interface. Use of serial ATA in the business market increased from 21.6% in 2006 to 27.6% in 2008. * USB3.0 specification released to hardware vendors 17 November 2008. Unlike PATA, both SATA and eSATA support hot-swappingby design. However, this feature requires proper support at the host, device (drive), and operating-system level. In general, all SATA devices (drives) support hot-swapping (due to the requirements on the device-side), also most SATA host adapterssupport this command. SCSI-3 devices with SCA-2 connectors are designed for hot-swapping. Many server and RAID systems provide hardware support for transparent hot-swapping. The designers of the SCSI standard prior to SCA-2 connectors did not target hot-swapping, but, in practice, most RAID implementations support hot-swapping of hard disks.